I quite like just how far the new Rakdos cards lean into the circus or carnival theme that the previous Ravnica block established for them. It does make you wonder, though, in that every guild was originally supposed to have a “purpose” under the Guildpact. Maybe they provide the city with entertainment? I don’t know, it seems just as likely that Jace is just bad at the job of Living Guildpact! 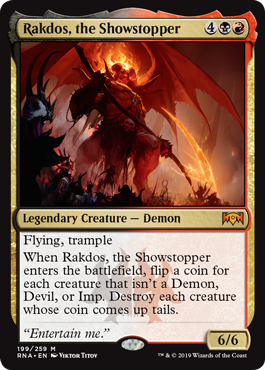 It’s been a while since we had a significant coin-flipping card in black-bordered Magic, and Rakdos’ effect certainly makes the uncertainty (or dexterity-related fiddling) of flipping coins worthwhile. The worst you get is a 6/6 flying and trampling demon, and the best you get is a one-sided Damnation. Remember that even if there are only two eligible creatures in play, you will kill one of them 50% of the time. The fact that you don’t always know which game that’s going to happen in means that the Demonlord may not be consistent enough for competitive play, but he should be entertaining in casual matches in formats with Krark’s Thumb. It’s just unfortunate his wording isn’t quite right to trigger Chance Encounter! The curtain rises, and Rakdos 3.0 takes to the stage. And is a bit weird, of course. The best-case scenario for Rakdos 3.0 is that it’s a six-mana one-sided boardwipe, which could happen! If you’re lucky. Coin flipping is not a common part of Magic, especially one with a fixed outcome, but there is a chance that you wind up nuking the board…or whiffing. You still get a 6/6 with flying and trample for your trouble, but this Rakdos feels more “fun” than actually good.